By loading all the projectiles nose to tail in a single gun barrel, Metal Storm eliminated the ammunition feed and casing ejection systems. The only moving parts of the system are the projectiles themselves. The electronic ignition allows for the firing of the stacked munitions at “electronic speed” without any delays caused by ammunition feed mechanisms. Capable of firing a range of different caliber projectiles with the added advantage of selectively escalating response from non-lethal to lethal the system was marketed as an extraordinary urban warfare and insurgency situations platform. Metal Storm technology is still in research and development. Metal Storm Limited has a subsidiary in Washington, USA and work is carried out on both continents. Although there have been issues regarding reloading, safety,recoil and barrel wear and barrel integrity, Metal Storm is likely to revolutionize the weapons industry. For more info on the Metal Storm technology check out the Metal Storm limited industry ad below. I have been following the development of this weapon concept from when I first saw it in November of 2000. It is absolutely incredible. My future son in law just came back from Iraq and I wish these systems would have been available to his Unit. Keep up the great development work and Godspeed! without moving parts how can it locomotes……….what are the elevation angles………..is it possible to impinge in upward direction……………how can you say it ejects 1 million projectiles per minute………..what’s the speed of the machine………whether the chance for overlapping of bullets……how much of amount to hit the destination in (kilometers)…….. This superimposed load system is as old as the hills. Guns that used this system were referred to as ‘Roman candles’ in the 16th Century. Joseph Chambers was granted a US patent for this system in 1813 and his guns were used by the American Navy against the British in the War of 1812 and contributed to their victory at New Orleans. The Multi-barrelled, swivel guns, carried by USS Constitution in 1815, could discharge 200 rounds in under 2 minutes. 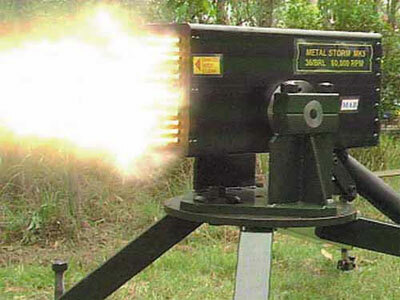 The main improvement made by Metalstorm is the ability to electronically fire each round individually, whereas the Chambers system was uncontrollable once initiated. The Metalstorm, multibarrelled guns also take seconds to reload, whereas the Chambers system took days. The only limiting factor now is the time the bullet takes to exit the barrel.